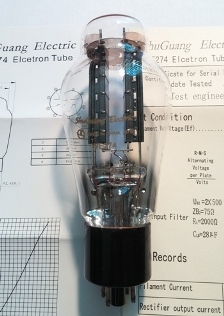 (5R4GB GYB,5U4G,5Z3P).Here you have a magnificent example of a WE replica 274B rectifier tube made by Shuguang, their top line product and design made by their most experienced technicians with the most advanced materials. It's virtually an exact copy of the original using modern alloys and materials. New from mfg. in their packaging. It's virtually an exact copy of the original WE using modern alloys and materials. It comes with a data sheet in a beautiful gift box.